16ga x 1/4" 16ga x 5/16" 16ga x 0.35" 16ga x 3/8" - Out of Stock 16ga x 1/2"
Create a sleek, stylish look with this steel micro labret stud. This petite labret stud is perfect for more delicate piercings such as nose piercings, monroe piercings, lip piercings and tragus piercings. The small-size steel ball looks discrete and is ideal if you have petite features or just want a less noticeable look. Buy two to create the perfect Angel Bite Piercing and Snake Bite piercing. I have bought this product quite a few times as they are a great subtle bar to keep in my lobe piercings to stop them from healing over! Great service and they always arrive within a day of ordering. Very pleased. Fantastic! I'm currently wearing a set in my pierced ears and honestly there are times that I forget I'm wearing them they're so comfortable! Got these for downsizing my lips from 1.6 and they fit really well and very comfortable. Always handy to have a few spares around too! i got this in 8mm for my newly healed Monroe piercing. I tried many studs but i have a small face & every other stud i tried looked like a giant spot on my face, it was rather distracting. Altough i wish i could have got one slightly smaller, stud wise this is about as small as you will find. Very attractive , well made & oh my what great value for money. very pleased. I got one 1.2mm x 10mm and I love it... 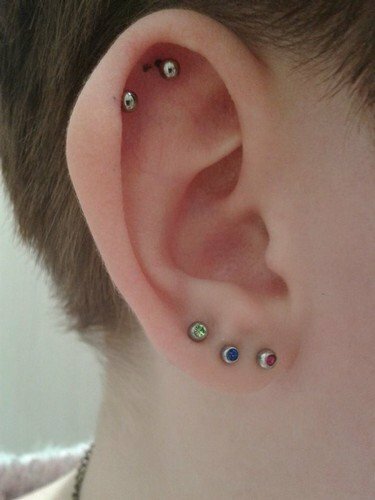 It fits quite nicely in my lobe piercing making it noticeable enough to see, but not especially eye-catching. Great if you just want something nice for everyday use or for a special occasion to look clean but not overly dressed up :) Very fast shipping too!! i've found it very difficult to find a labret stud to fit me, but this 9mm stud fits perfect and looks great.